The first year of life in a horse can be filled with many ups and downs for both the horse and the owner. Generally speaking, we can break up the first year of life into 3 distinct age categories: neonate (first 30 days of life), weanling (generally 3 to 4 months of age), and yearling (12 months of age). Each age group or stage of life during the first year is filled with important distinctions, which separate each from the other. 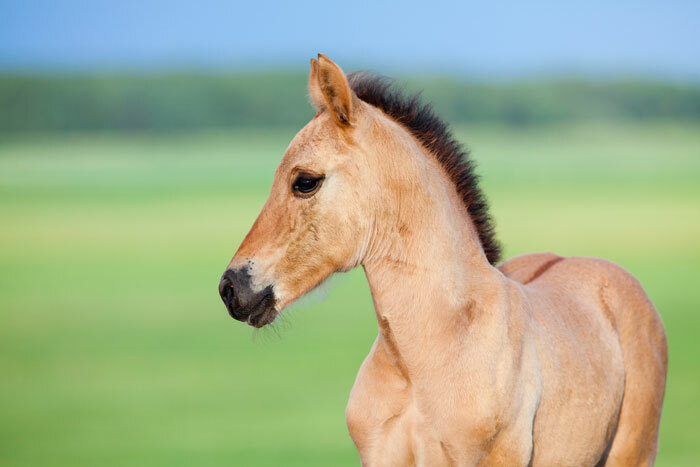 They are also characterized by the development or recognition of unique diseases or pathologies that are likely to occur during certain parts of the horse’s first year of life. 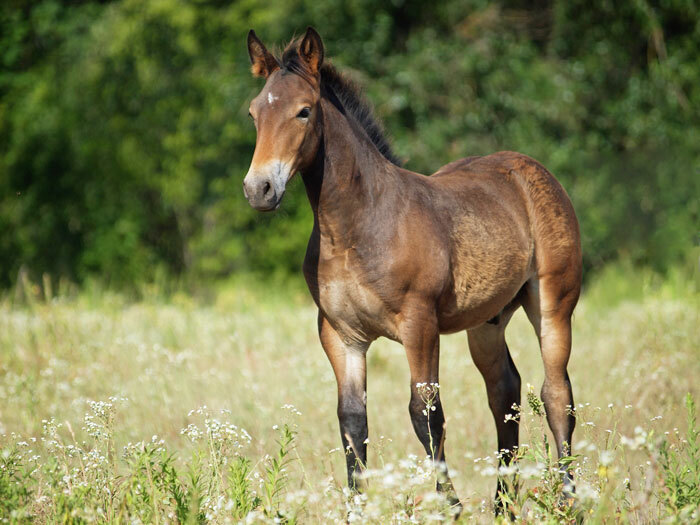 These proceedings cover a few of the many common disease processes, which may affect your horse during the first year of life. Hopefully they can provide some insight as to recognition, handling and corrective measures, which can be taken when dealing with some of these common problems during the first year of life. Angular limb deformities (ALDs) are characterized by abnormal positioning or growth of the distal limbs and most commonly identified in the neonate and weanling age groups. They are classified based on the location of the most severe angulation or deviation in association with a specific joint (i.e. carpus, tarsus or fetlock). Angulations occurring away from midline or the central portion of the body are termed valgus (lateral) limb deformities, and those that deviate or angulate towards midline or the central portion of the body are termed varus (medial) limb deformities. ALDs have been attributed to numerous causes including malposition in the uterus during fetal development, genetic predisposition, poor nutrition and exposure to toxic agents. Early recognition is important in allowing enough time to take appropriate corrective measures when dealing with ALDs. Corrective measures include benign neglect combined with stall confinement, corrective trimming of hooves or shoeing applications, or growth plate retardation with the aide of surgical implants. Surgical correction must occur by certain age periods in order to have positive effects and allow for continued growth after the surgical procedure is performed. Surgical correction is performed prior to closure of growth plates in the distal radius and tibia (carpal and tarsal ALDs) and distal metacarpus and metatarsus (fetlock ALDs). Fetlock ALDs are best surgically corrected prior to 60 days of life and carpal or tarsal ALDs should be corrected during first 3 to 12 months of life depending on surgical technique of choice. Mild or less severe ALDs often correct on their own as the young horse matures. Carpal and tarsal valgus deformities are very commonly present in the newborn and mild degrees often correct on their own as the foal matures into a yearling. Mild to moderate ALDs can be corrected with trimming or corrective shoeing applications. In order to achieve improvement from these corrective measures, it is important to apply these methods early in life in regards to the specific location of the ALDs (i.e. carpal, tarsal or fetlock ALDs). For example, when addressing a fetlock or carpal varus (medial deviation) deformities, often by trimming or lowering the inside solar margin of the toe and quarter of the hoof; this will allow more pressure or strain to be placed on the outside portion of the foot promoting corrective growth overtime. In addition, the opposite measure can be applied for fetlock or carpal valgus (lateral deviation) deformities, by trimming or lowering the outside solar margin of the toe and quarter. Similarly, different types of hoof acrylics or shoe extensions can be placed using similar principles as corrective trimming of the hoof in order to counteract the current growth forces or strain placed on the limb. All corrective measures must be done in careful recognition of the delicate nature of the neonate foal. Moderate to severe ALDs often are corrected with surgery by performing growth plate retardation in the region of interest. Surgical options include periosteal transection and elevation and transphyseal bridging techniques. Periosteal transection and elevation is performed at the level of the growth plate or physeal scar in relation to where the angulation or deviation is most severe. The purpose or proposed mechanism of action is a release of the periosteum and subsequent increase in growth on the side of the growth plate where the procedure is being performed. Therefore, the procedure is often performed on the opposite side of the limb where the angulation or deviation has occurred (i.e. carpal valgus will receive a periosteal transection and elevation on the inside of distal radial physeal scar or growth plate). Research has presented confounding evidence as to the benefits of periosteal transection and elevation; however it is still widely performed all over the country.Transphyseal bridging is a technique whereby the growth plate or physeal scar is slowed down in growth by intermittent bridging of the affected side of the limb (i.e. carpal valguswill receive a bridging technique on the inside of the distal radial physeal scar or growth plate). This transphyseal bridging technique can be performed in one of three ways:physeal stapling technique, screws and wire technique, or a single transphyseal screw technique. The first two techniques involve placing metal implants (staple or screws) on each side (top and bottom) of the growth plate. Wires are used in the second technique to bridge the gap between the two screws placed in order to delay growth on that side of the limb. Thesingle transphyseal screw technique involves placing a screw across the physeal scar or growth plate in order to restrict growth on the affected side and allow the opposite side to catch up in length. With each of these techniques, the hardware or metal implants must be inserted and removed under veterinary guidance. It is extremely important to carefully monitor correction of the limb weekly with the aide of your regular veterinarian when using these surgical implant techniques. If left in too long, over correction can occur and additional surgical implant procedures will be required on the opposite side of the limb. It is always important to involve your veterinarian when deciding the degree of ALD in your foal. Proper timing of corrective measures is extremely important when deciding to correct these angulations or deviations before closure of growth plates. Flexural limb deformities (FLDs) are characterized as deformities described as laxity or stiffness in a relation to a specific joint in the limb. These typically cause an inability to completely extend or flex a joint. FLDs can be present at birth (congenital) or develop after birth (acquired). They are most commonly present in the forelimbs, but can be also identified in the hindlimb. Suggested causes of FLDs are similar to angular limb deformities including malposition in the uterus during fetal development, genetic predisposition, poor nutrition and exposure to toxic agents. Congenital FLDs are typically present in the fetlock or carpus region and involve one or multiple joints. Ranging in severity, severe cases are often euthanized due to extremely poor prognosis. However, aggressive medical and surgical therapy is often successful in mild to moderate cases. Acquired flexural deformities are most often related to excessive nutrition (protein) in the yearling and two year old horse or secondary to a severe injury in the forelimb or hindlimb. The most common acquired flexural limb deformity results in a conformational abnormality termed club foot. This club foot is characterized by having an upright hoof wall conformation or “club-like” appearance to the foot. Medical therapy of FLDs is most often encountered and addressed in the newborn foal. If present or identified later in life (weanling or yearling), surgery is often necessary for correction. Medical therapy for FLDs includes controlled exercise, splinting, corrective shoeing or trimming, and combined oxytetracycline therapy. If the newborn foal is able to stand on its own, restricted controlled exercise for approximately 1 to 2 hours daily is recommended in order to allow for stretching of the soft tissue structures (tendons, ligaments and joint capsules) located on the front and back of the limb. Most often these foals, are often quoted as being, “slightly over at the knees”. Direct monitoring for improvement daily is recommended and cautioned. In some instances foals are able to stand on their own, but with the fetlock or carpal jointslightly knuckled forward or flexed. These foals often benefit from splint applicationapplied to the area of interest. Splints are generally applied by your veterinarian from 6 to 12 hours at a time to allow for normal extension of the limb and stretching of the soft tissue structures on the front (extensor tendons) and back (flexor tendons) of the leg. It is important to consult your veterinarian when proceeding with splint application due to the fragile skin and sensitive nature of a newborn or young foal. Incorrect placement of a splint can lead to severe complications in the foal. Corrective shoeing or trimming for FLDs is generally restricted to toe extensions. However, veterinarians may also recommend hoof acrylics or specific shoes to aide in correction. Toe extensions are generally indicated in foals, which knuckle forward in the fetlock region or those that present with extreme laxity in the toe region (severe flexor laxity with the toes pointing up). In either case, toe or heel extensions can be difficult to keep on the foal for extended periods of time. Intravenous oxytetracycline can be combined with the previously mentioned medical treatments in order to treat foals with congenital FLDs. The proposed mechanism of action is caused by relaxation of the tendons. This in combination with controlled exercise or splinting techniques is often successful. A veterinarian may choose to treat once or up to three separate treatments when considering oxytetracycline therapy. 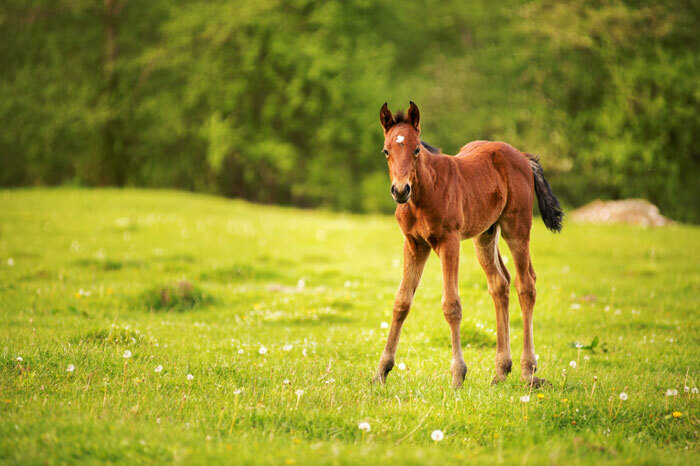 It is generally thought that the most dramatic effects observed from the use of oxytetracycline therapy are within the first days of life, but some practitioners promote its use in older foals as well. With any and all of the following medical treatments, non-steroidal anti-inflammatory use is recommended to lessen the pain associated with the stretching of the soft tissue structures of the limb. Careful dosing of non-steroidal agents in the newborn is important in prevention of equine gastric ulcers and should be performed in consultation with your veterinarian. Surgical therapies of FLDs are most commonly recommended for mild to moderate degreesof disease and are typically reserved for those patients that are non-responsive to medical therapies or develop an acquired FLD. These procedures are also recommended in patients that have been diagnosed with a clubfoot. A clubfoot is characterized by an upright hoof wall appearance and is caused by excessive pull or traction of the deep digital flexor tendon on the solar margin of the coffin bone. The basic concept behind surgery for FLDs, generally involves transaction of the soft tissue structures of the limb. Generally the soft tissue attachments of the superficial and/or deep digital flexor tendons (SDFT or DDFT) termed the accessory ligaments or check ligaments are transected to aide in correction of these FLDs or clubfoot disease processes. Transecting the accessory check ligament of the SDFT and/or DDFT still allows for athletic ability in the horse. Transection of additional or alternative structures (DDFT or suspensory ligament) in more severe cases is generally a salvage procedure to save a horse’s life. In general, flexural limb deformities are successfully treated with the aide medical and surgical therapies. It is important when recognizing these potential lesions to always consult your regular veterinarian before implementing any corrective therapies. Most often horses, can be treated and develop normally having a successful athletic life. The urachus is a tube that connects the bladder to the umbilicus, which normally should close in the newborn foal. However, sometimes, this structure remains patent and becomes a problem. Continued dripping of urine or patentcy of urachal structures throughout the length of the entire umbilicus characterizes patent urachus. 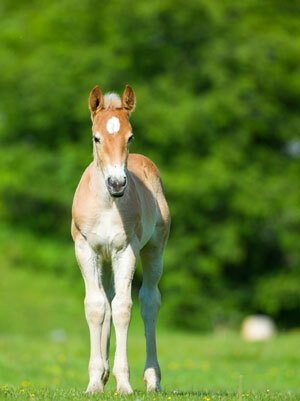 It is sometimes thought to be normal in foals for up to three to five days of age. Failure to close can lead to septicemia (blood infection). Therefore, medical or surgical procedures are recommended for correction. Medical and surgical therapies include systemic antibiotics, cauterization of the umbilical stump or surgical resection. If a patent urachus is present, an ultrasonagraphic examination is warranted to evaluate all umbilical structures and identify any possible infection. Medical therapy involves antibiotic therapy which sometimes allows final closure of the urachal structure. Some practitioners will use silver nitrate sticks to cauterize the area and promote closure. If medical therapy is unsuccessful, surgical removal of the umbilical structures is recommended. This is performed by removing the remnants of the umbilical vein, arteries and the urachus itself. In order to completely remove the urachal structure, a cystotomy (incision of the bladder) has to be made and surgically closed. The bladder incision is closed followed by the body wall incision. In general, surgical correction of a patent urachus is not an emergency procedure and has a very good prognosis post-operatively. Omphalophlebitis is an infection of any one or all of the umbilical structures (umbilical vein and arteries). This infection if not treated appropriately can lead to septicemia or an internal blood infection, which can seat bacteria to numerous locations throughout the body, most commonly a synovial structure (joint) or the respiratory tract (lungs). Diagnosis is confirmed by typical appearance of umbilical stump (enlarged, warm, firm), elevated white blood cell count upon evaluation of systemic blood work and enlarged umbilical structures on ultrasonography exam of the umbilical structures. Similar to patent urachus medical therapy, systemic antibiotics are recommended for foals that present with infected or septic umbilical structures. If medical antibiotic therapy is not successful typically within 7-14 days, surgical resection is generally recommended for resolution. Surgical resection involves removing all umbilical structures (umbilical vein and arteries, urachus) and performing a cystotomy (incision of the bladder). The bladder and body wall are closed after removal of the infected structures. Most foals generally remain on antibiotics for a specified period of time post-operatively. The prognosis is good for a septic umbilicus and is generally not an emergency procedure. Umbilical hernias are congenital (present at birth) defects in the newborn foal characterized by a defect in the body wall. They can range from very small defects to extremely large defects (2 to12 cm). Umbilical hernias should be differentiated from umbilical infections by careful palpation. Consulting with your veterinarian is recommended for both pathologies.Umbilical hernias are generally non-painful, non-firm (skin sack with intestines protruding through defect in the body wall), and can be reduced digitally with your fingers. Some umbilical hernias can progress to strangulation of the intestine and cause severe signs of colic, however this is rare. Smaller hernias (2 fingers or less) are generally recommended to be reduced daily and often spontaneously close on their own as the horse becomes older (typically by 12 to 14 months of age). Larger hernias or hernias that fail to close spontaneously can be repaired surgically or by placing a clamp over the hernia. Clamping umbilical hernias involves taking the skin and crushing it together over time causing the area to scar. This technique is not practiced commonly due to the complications potentially involved. A piece of intestine can become entrapped within the clamp leading to a strangulating lesion resulting in severe colic and potentially death of the animal. Surgical resection of an umbilical hernia can be performed using the closed or open technique. While the closed technique is less invasive (never entering the abdominal cavity), it has a higher percentage rate of failure and repeat procedures are necessary. The open technique involves an incision into the abdominal cavity removing the inguinal sac and securing the two sides of the body wall and skin margins together. Surgical resection of umbilical hernias carries a good prognosis and is rarely an emergency procedure. Always consult your veterinarian for advice when trying to decide how to treat an umbilical hernia. When one or both testicles (testes) are not descended in the scrotum, the horse is called arig, ridgling, or cryptorchid. This usually represents failure of the testis to move, or”descend”, during fetal development from an abdominalposition, through the inguinal canal, into the ipsilateral (same side) scrotum. This process generally occurs by the second week of life; however some owners and veterinarians will wait up to one year to allow successful descent. The cryptorchid testicle is important due to the fact that it is unable to produce normal productive sperm, but continues to produce the hormone – testosterone. The hormone, testosterone produces the stallion-like behavior characteristics that are often unwanted in the horse. It is also possible for these cryptorchid testes to develop into tumors as well compared to the normal descended testicle. There are several types of cryptorchid testicles described in the literature – high flanker, inguinal and abdominally retained testicles. A “high flanker” cryptorchid testicle is one that is under the skin near the external inguinal ring. An inguinal retained cryptorchid testicle is located within the inguinal canal between the internal and external inguinal rings. An abdominally retained cryptorchid testicle is located completely within the abdomen and never enters the inguinal canal. Cryptorchidism of the left and right testicles occurs in equal numbers. However, the left testicle is much more commonly noted to be an abdominally retained cryptorchid testicle compared with the right testicle (approximately 75 percent).Diagnosis is based on previous history of an undescended testicle or by measuring hormone levels of testosterone within the blood. Often times, yearlings or stallions are presented to veterinarians for castration and upon evaluation, a cryptorchid testicle is diagnosed. Due to potential loss of information and frequent exchange of livestock, it is recommended that if a cryptorchid horse is identified, the alternate testicle not be removed until the cryptorchid testicle is appropriately removed via surgery. Therefore, upon diagnosis, your veterinarian may forego to remove the alternate descended testicle until the cryptorchid testicle is removed surgically. There are numerous surgical techniques described for removing the cryptorchid testes. More commonly the yearling or stallion is placed under general anesthesia whereby an incision is made over the inguinal area and the testicular tissue is identified and cryptorchid testicle removed. This procedure is referred in the veterinary literature as a laparotomy. Alternatively, with the advent of non-invasive surgical techniques, some cryptorchid testes can be removed in the standing or anesthetized horse with laparoscopic technique. Only the abdominally retained testicle can be removed using this technique, where a camera is inserted into the flank or ventral abdominal region of the standing or anesthetized horse to identify and remove the abdominally retained testicle. The standing technique does not require general anesthesia and may be performed in the standing horse. Cryptorchidism is a common disease problem noted within the young horse. They are well recognized and easily diagnosed by your regular veterinarian. Surgical removal is essentialand carries few to minimal risks or complications. Osteochondrosis is probably the most important disease of all the developmental orthopedic disease processes. Depending on the breed, incidence rates can reach 25 percent of the population and cause significant economic impact to the equine industry or owner.Osteochondrosis is a multi-factorial disorder in which both hereditary components andmanagement aspects play key roles. Important management factors include nutrition and biomechanical loading of the joints. Osteo (Latin for bone) and chondrosis (Latin for abnormal development of cartilage and bone) describes the disease process in young horses whereby a defect in the development of ossification of the bone and cartilage occurs. These lesions may also be referred to asosteochondritis dessecans (OCD) lesions. These OCD (cartilage flap) lesions are considered a specific type of osteochondrosis. The other specific lesion referred to under the umbrella of osteochondrosis is subchondral bone cysts (SBC). These defects can lead to abnormal loads being placed on what should be normal bone causing pathology and eventual fracture or lysis of a segment of cartilage and bone. Rarely, do the fragments become completely loose within the joint. Due to nature of development of these osteochondral lesions, it is common to see these lesions in the young, maturing horse. Fragments identified in the older, athletic horse are often traumatic induced lesions. These loose or abnormal osteochondral fragments or SBC cause a significant amount of inflammation in the joint that can transform into a cyclical inflammatory event ultimately progressing to degenerative joint disease (osteoarthritis). The inflammation present within the joint causes pain, swelling and irritation resulting in reduction of eventual athletic performance. Diagnosis is based on physical appearance of the joint (swelling), lameness examination, and/or radiographic examination of the joint. Surgical removal and/or debridement of these osteochondral lesions are generally recommended as the best form of treatment. Removal and/or debridement of the osteochondral lesions eliminate the source of inflammation and allow eventual healing of the joint. Scar tissue forms over the previous site of injury called fibrocartilage. The procedure is accompanied by a short period of rest and is not an emergency procedure. Osteochondrosis is common problem seen in young, growing horses. It is easily diagnosed upon evaluation of your horse by your veterinarian. Surgical removal for treatment is generally recommended and a straightforward procedure. Previous Post:As of January 1st, the 2017-2018 AQHA Ranching Heritage Young Horse Development Program has officially begun!